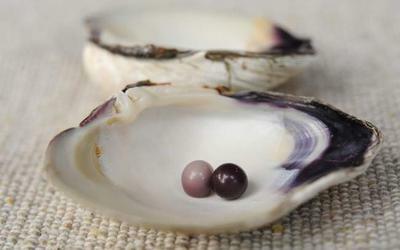 Two pearls discovered by Lisa McGrath and her daughter, Lindsey, while raking in Buzzards Bay. 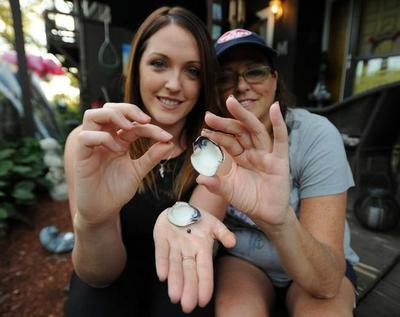 Lisa McGrath, right, and her daughter, Lindsey, discovered two pearls in a quahog while they were raking for the shellfish in Buzzards Bay. BOURNE — The tiny littleneck clam with a dented shell hid more than just a little surprise. Lindsey McGrath was shellfishing with her mother, Lisa, on Labor Day weekend when she plucked an odd-shaped quahog from the ocean at their secret spot in Buzzards Bay. Upon opening the hard-shell clam the next day, the duo was stunned to see what was inside. “I found a pearl!” Lisa McGrath recalled during a recent interview at her home. And what could be better than finding one pearl? “After I removed that pearl, I found another one and couldn’t believe that there were two,” Lisa said.